Getting tatkal tickets from Indian Railways site https://www.irctc.co.in/ is a difficult task. 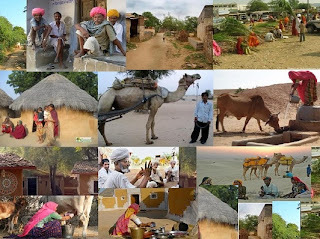 Tatkal reservation starts only at 8 o clock in the morning of one day before the day of travel. So there will be a large number of people trying to access IRCTC site in that time (those who couldn't book in advance, and those who are looking for a ticket under emergency travel conditions. ). Hence it is very difficult to get ticket in that time. There will be many replays saying 'service not available' and other error messages because of the large number of people visiting the site at this peak time. I expect you will have 2 or 3 web browsers like internet explorer, Mozilla Firefox, Google chrome etc installed in you computer. Create many accounts in IRCTC site (For creating an account you will need a separate mobile number) and log in using these accounts using different browsers. (Remember while creating these IRCTC accounts never use same phone number because it is not allowed to use multiple accounts). If you do not have more than one account, borrow your friends account. It is always better to have the most fast internet connection with you, as a large number of users are trying the more speed you have the more better it is. 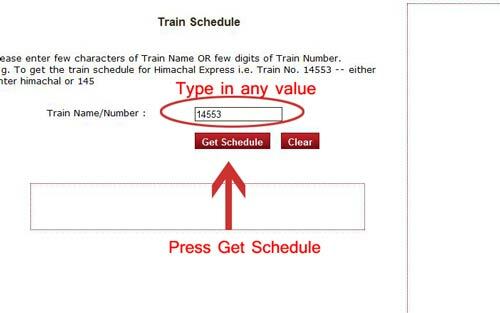 Remember to log in to IRCTC site 4 minutes before 8 o clock and make your system clock time and the time shown in IRCTC site the same this will hep you to track time and know exactly when 8 'o' clock is reached according to IRCTC timing. If you are logging in very early, try to keep your session active by clicking in differently links inside the site,otherwise by 8 o clock your session may expire. By some 7.59 am rest by selecting some link other than Plan My Travel link. Because at exactly 8.00 am in your computer (same as IRCTC time as you have synchronized it) you need to click Plan my Travel link and have to fill in the details. You should have all the data that you need to be filled during the booking process along with you before you are starting. First one is the source and destination station codes. (remember the station codes for source and destination. If you do not know, search and find in advance. You can use Google for this purpose.). Now according to new regulation of IRCTC, they are asking for ID card number of at least one person. So you should enter ID card type and ID card number. Keep this with you. You can use autofilling addons for browsers or remember form field history option of browsers to make this data entry fast. First you have to find available trains, selecting source and destination of travel. After getting the list of trains, you have to select the train you want and click book button available. Then you will get a page to fill in the details of the person who is traveling. Now maximum number of people allowed to travel in one Tatkal ticket is 4 only. 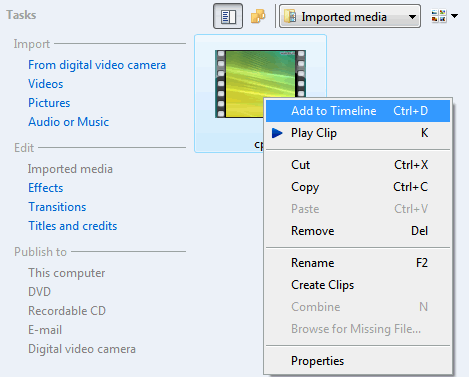 For filling in these details you can use auto fill add on in Firefox described in step 3. 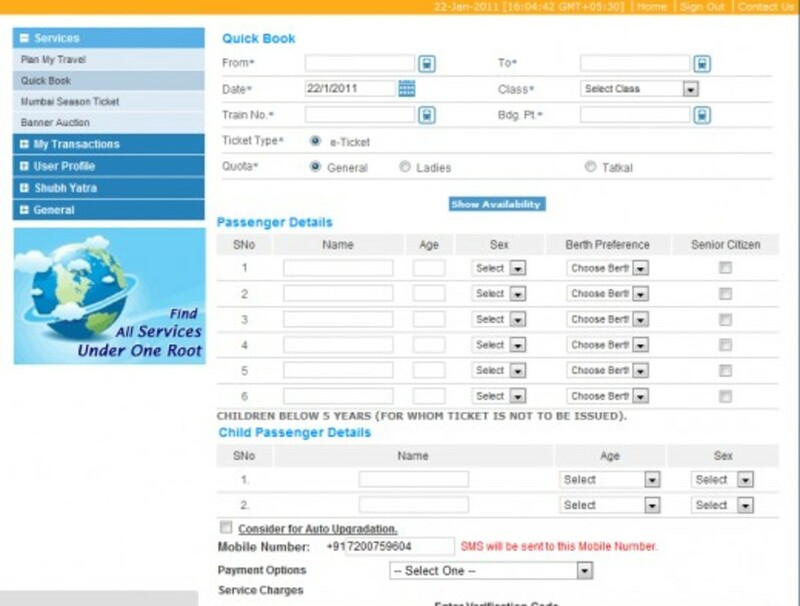 It will let you fill details of all passengers in one click. Then you have to select a payment option and make the payment through net banking, cards etc. But it is found that net banking is more fast compared to other ways. Also try with different banks on which you have account and find out the fastest one for booking. There is an option under services Quick book. Select this option. In this you can book ticket quickly provided you know the number of the train in which you want to travel. Fill this form quickly and press quick book button. It will go straightly to banking site without asking for any further verification an confirmation. But now for booking emergency tatkal it is of no use as it is not available between 8am and 9am-the peak time of tatkal booking. But if you are booking tatkal after 9.00am it is useful. Now you may have found that the only time taking section in this tatkal booking process is the filling of details in form. 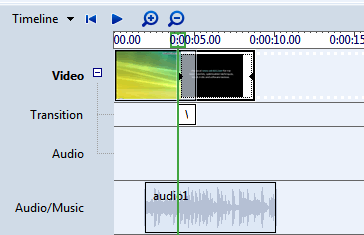 This can be done in one second using autofill addon in mozilla firefox. So you have to install this addon earlier. You can add this to firefox in the link https://addons.mozilla.org/en-US/firefox/addon/autofill-forms/. After installing this addon you have to fill the form and save it in the addon. Now during the booking time you have to simply right click in the page and select autofill of that page. in the address bar after coming to details entry page and press enter. Only after that you can right click on the page and select autofill the details that you have stored earlier for booking. 1. Consider some more things about the internet connection that you are using. Most of the internet users in India are using BSNL net connection. So the traffic to IRCTC from BSNL servers will be very high. Hence try for other internet connections. If you have any friends outside India, tell them to book ticket for you from there, as they are accessing from different servers with less traffic to this particular site, they will face less problems like Service Unavailable reply. 2. Enable the low speed internet connection option in your browser (some browsers like opera have it) even though you are using high speed internet, during the booking time. This helps to load the page as data is receiving. This will help you to enter data even when page is loading. and login into them from different accounts. later, you dim your chances to book the Tatkal rail ticket. So how to know the correct time? Download & install different browsers on your computer: Firefox, Google Chrome, Safari, Opera. Now have at least 3-5 IRCTC logins of your relatives ready. Login from each browser using different login name. Also from each browser open another window with IRCTC login page with your login and password filled in. So if your login in Firefox does not work then from this another Firefox window login again just by pressing Submitting button. For Tatkal every second counts. Save your time by having your login/passwords and other details filled automatically by single click. On Firfox you can use free add-ons like Auto Fill forms. If you want to pay up to Rs. 1400- 2000 then you can buy a more professional version like RoboForm. You can now book like professional IRCTC agent. Use the bank account which requires minimum inputs. SBI and HDFC's are one of the best. Check the IRCTC payment gateway statistics and avoid using those banks whose transactions mostly fail. For example in this list you'll see that Rajasthan Bank's Netbanking success rate is only 39%! While ITZ Cash Card is has the highest success rate among all channels. Never ever use ICICI Bank account. You'll never be able to book a Tatkal using it. Avoid account of Yes bank because for payment it sends one password on your mobile which can get delayed. Have ready the source/destination station codes. You'll need to click "Plan your travel" link to proceed. You need only max 4 characters station codes in it. Find the station codes from here. Mind you when you login, "Plan My Travel" is opened ready for you. Just fill the station codes in the "From" and "To". Select Date, Ticket Type and Quota(Tatkal here). Click "Find Trains" button only after 8 am sharp. Mind you Quick Book is disabled for Tatkal in the morning. Don't use it. Never click a link twice. IRCTC site will give error and you'll need to relogin. Reload/F5 may be used only once if your request has not reached IRCTC computer servers. Say when you pressed Submit and at that time internet was disconnected then, safely you can retry form submission after reconnection. Otherwise your login session will be closed by IRCTC. If the network is very slow wait for some time ( 4 minutes). Never press refresh or F5. Rather login into the same account again from IRCTC login page by opening another window of your browser. Always wait for the page to load completely before you press any buttons. Check the browser status bar or other places of indication of page load. After you've made payment if your site does not load while redirecting to IRCTC in 5 minutes then press F5 only once. Sometimes this will work. If you've made payment then if you've set SMS alerts in your bank account, then you'll get SMS in your mobile about the payment. If your payment is made but disconnected or page did not load for ticket confirmation, then immediately check your e-mail id(given in IRCTC login) and see if you've received any ticket confirmation e-mail from IRCTC. Don't use Rediff e-mail accounts since it may delay e-mail notifications by couple of minutes. Have somebody site beside you to oversee the details you fill in. since in hurry it is very easy to make mistake and lose precious ticket. Don't do copy paste of values as it may create problems in IRCTC site while filling form details. The best way to get Tatkal ticket is to go to Railway station early( before 7.30 am) and be first in the queue and get the ticket from the counter . Getting from online is more like a lottery for most of the trains. Install the Unified Remote server application on your computer. This will allow your device to connect and communicate to your PC on your home network. Requires Windows and .NET Framework 4. Get the Unified Remote client application from the Google Play. 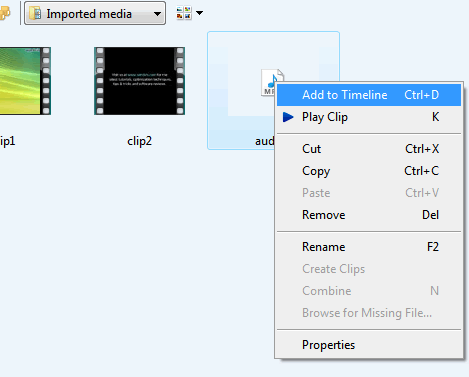 Connect to your PC and control Media Playback, Mouse, Keyboard, PowerPoint, and much more. See features comparison. We are currently redirecting all of our donations to HopeHIV. Click the badge below to find out more! bitsandchips Unified Remote: Remote Control turns your smartphone. gurushala.net Unified Remote Android App that lets you control your Computer from your Android phone. getandroidapps.net A must try out app for all Android lovers. crustykritics.com Setup simplicity, general intuitiveness and attention to detail make Unified Remote highly recommended and an essential part of my home theater setup. All released versions of the server are available. Only use old versions if you are experiencing problems with the latest released version. You should first download and install the Unified Remote Server application on the computer you wish to control. Simply download, install, and start the application. The settings window provides: status and general settings, connection configuration (TCP, UDP, Bluetooth, etc), security (Password, Encryption), remote specific configuration, log, and about. Once everything is configured, you can close the server window, since the application will continue to run in your system tray. 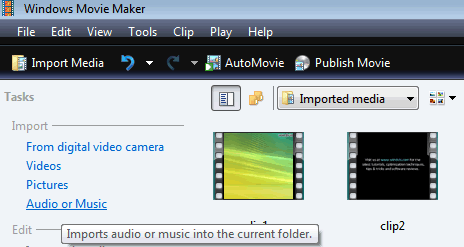 You can always open the server window again by either right-clicking or double clicking the Unified Remote icon. Next you should download and install the Unified Remote app on your device. The app is available on the Android Market. Simply search for 'Unified Remote' developed by 'Unified Intents'. Once the application running, follow the in app instructions. The dashboard offers quick access to all the main parts of the app. New manager and bluetooth support. Easy to use server manager, automatic detection or manual entry, easy selection of paired bluetooth devices. Improved stability and troubleshooting. Clear notifications regarding connection loss and errors, new diagnostics tool for troubleshooting connectivity issues and errors. Improved phone integration. Providing easy access to mouse and keyboard using menu or on-screen swipe gestures, all new system keyboard support, hardware volume control, and phone events. Many new remotes. Focusing on advanced control of applications. All new remotes for: Boxee, iTunes, Media Player Classic, Media Portal, Start Menu, Winamp, VLC, XBMC. Significant improvements to all previous remotes. More to come! Directly to remotes. Create shortcuts to your favorite remotes on your home screens. Built-in wake on lan functionality. Easy to use Wake On Lan feature in Power remote. Configured using Broadcast IP and target MAC Address. If you have any problems, then please start by reading our FAQ. If you are unable to find a solution to your problem there, then please contact us.